Claims: "The revolutionary Kiss InstaWave is a fully automatic curler that instantly creates beautiful, long-lasting curls with ease. 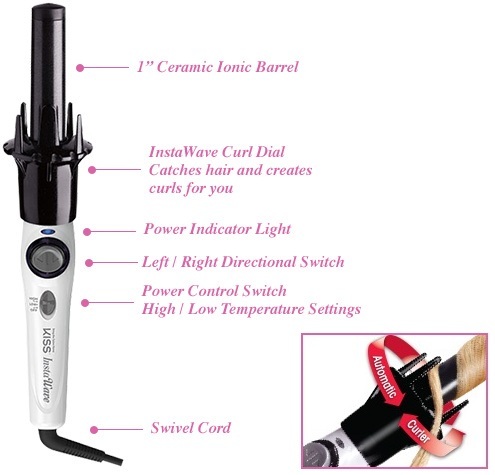 KISS InstaWave is a fully automatic tangle-free curler that instantly creates beautiful curls"
Hellllooo!! It has been a really long time hasn't it? I will have a 'life update' post soon about where I've been and what I have been up to. Any-who.. I will be reviewing the InstaWave by KISS. In case you are not familiar with the product, it is an automatic rotating curler that claims to give instant long lasting curls. My job here is to let you know if the product lives up to the company's claims. I love curling my hair, I usually do it without heat but there are definitely times where using a curling iron comes in handy. Let me begin with some details about my hair. It is straight, dry, thick, color treated, layered and recently chopped from long layers to medium length with layers. Now that you have a few details about my hair let's get started with the actual review. The curler is well made. The product is black and white and the handle is easy to hold (not too wide not to narrow). The barrel is 1 inch thick but I find it to be a bit too short for longer hair. 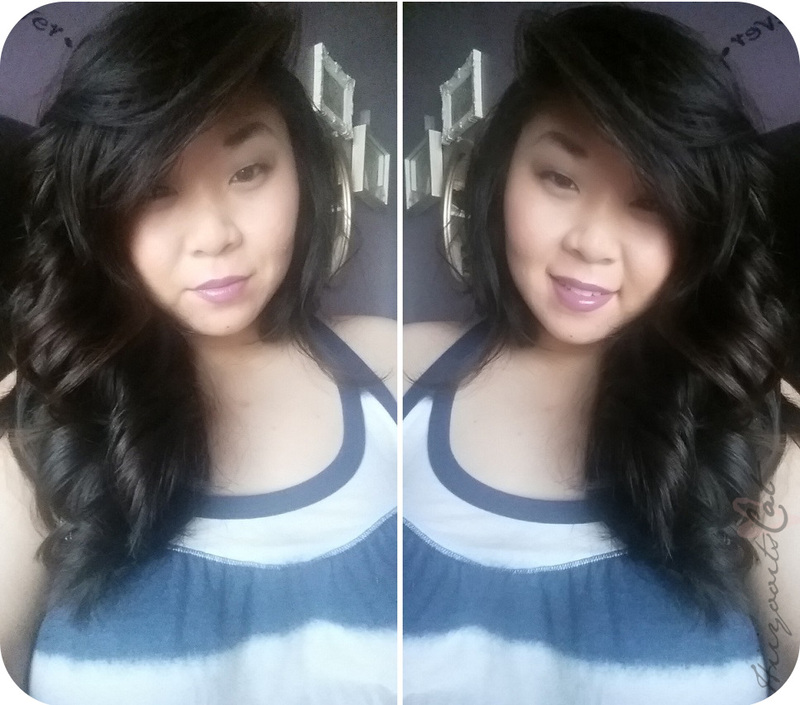 When I first used it I had long hair (down to my waist) and I found it hard to curl the entire strand. That is probably the only issue I have with packaging. 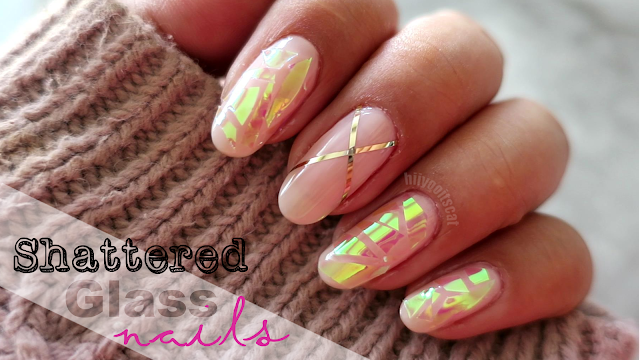 I hope they come out with different sizes and lengths in the future. Comes in the standard box with a quick guide and manual. Curl Dial: Grabs your strand of hair while it is rotating. Directional Switch: Turns the dial left or right. Great for people that like to rotate the direction of your curls. Power and Temperature Settings: Has two temperature settings (low & high). The high temperature is 420. The curler also turns off automatically after it has been on for 90 minutes. Swivel Cord: Prevents tangling of the cord and offers more control of the curler. I have to say that the barrel gets really hot (a ton of steam comes off from it), therefore, after releasing the curl it will also be hot (give it a few sections before touching your curls). I mentioned the steam previously, however, it does not effect the use of the products or the outcome of my curls. Even though the barrel is 'really hot' and a ton of steam comes out, it does not burn my hair at all. It also took me about 30 minutes to do my hair using the InstaWave. That's about 10 minutes more than using a regular curling iron for me (I would rather spend more time on my make-up than my hair). I always use a heat tamer spray (Tresemme). This was the result from the first time I used the product when I had longer hair. I feel like my curls looked more like loose waves and I had to curl in two different places in a single strand (middle and towards the scalp). My current medium length hair and layers. It was much easier to curl since my hair was shorter. The entire strand would wrap around the barrel with ease each time giving a more defined and tightened ribbon curl. I also ran my fingers through my hair (top right). The curls stayed intact and loosened up nicely without losing too much shape. I decided to give the KISS Instawave the 3.5 heart approval. I really like the product and enjoy the results, however, there are a few key points that I cannot over look. For the current length of my hair (slightly pass underarms), this product is great. However, for longer hair it is a little harder to work with. It is also a bit slow in my opinion. Not that I want the dial to rotate 3x fast (no-one wants their hair to get tangled and stuck in the rotating dial) but it could be a bit faster. 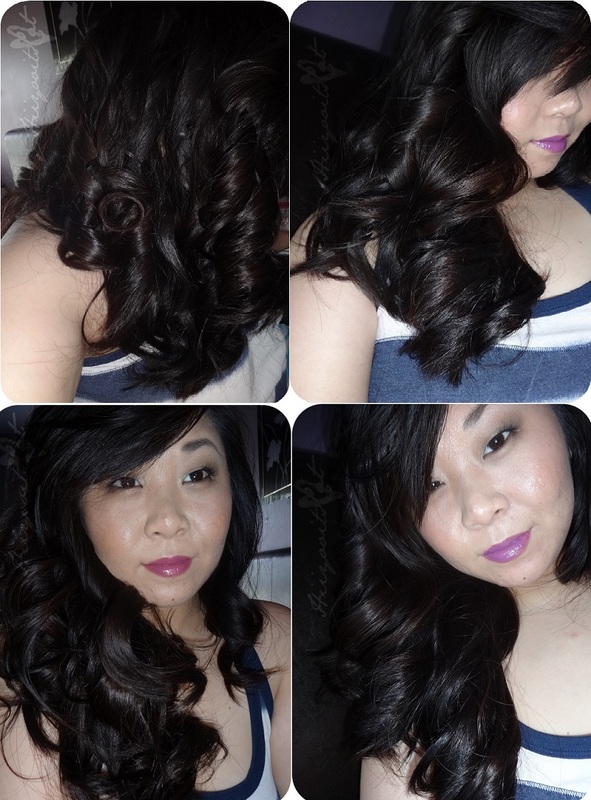 I also noticed that you have to do more sections than you would with a normal curling wand or iron. If you grab a wide section the heat will not distribute evenly. The thick section will also get tangled below the dial and get stuck (smaller sections are better to work with). Aside from the cons.. there are a few pros. One of the claims was that it gives long-lasting curls and YES IT DOES. My curls lasted for up to 3 days (probably would have lasted longer if I didn't wash my hair). That is also without any hair products, aside from my heat tamer and dry shampoo. I love that it heats up fast as well as does not burn my hair with it's temperature of 420. I also cannot over look the piercing sound that it makes, especially when it's right next to your ear. I did contact KISS about the issue and their response was "Regarding the sound the InstaWave makes when it is plugged in, we are aware of the high pitch sound caused by the circuit to drive the motor. However, it has no safety issue!" Since, it has no safety issues I don't have a problem using it but the sound does get a bit annoying after a while, preventing me from choosing it over another iron. With more practice I am sure I will be able to cut the time from 30 minutes down to 15. It definitely takes some getting use to and the first time will not be a breeze, however, with practice anything will become easier. If you have medium-short hair and want beautiful, long lasting curls I recommend this product but if you have longer and thicker hair you may want to wait to see if they come out with a longer barrel in the future. It's not that it's terrible for longer hair but it is more time consuming (double the sections and the barrel is a bit too short to be able to wrap the entire strand).